Bluetooth, Rear View Camera, OnStar! This fashionable, trustworthy, and completely versatile 2015 Chevy Traverse crossover SUV is a perfect fit for you. Giving you a smooth and calm ride with the agile handling and fearless drivability that you crave on downtown routes or in a wide highway. 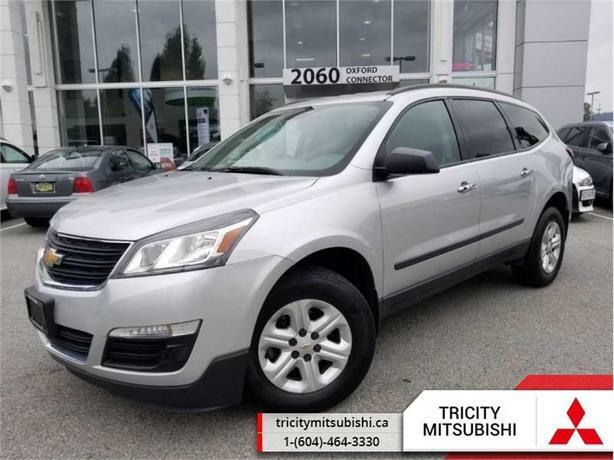 This 2015 Chevrolet Traverse is for sale today in Port Coquitlam. The 2015 Chevrolet Traverse is a larger crossover SUV that has an expansive cabin, a long list of features as well as top-notch crash test scores. With seating for up to eight passengers, there is plenty of room for your sporting gear, team members, or a group of friends for a night out. While the Traverse offers a large cargo area when all of the seats are full, folding the rear seats down gives you the largest cargo capacity in the segment if you need to haul larger items for work or play. This SUV has 88829 kms. It's silver in colour and is completely accident free based on the CarProof Report. It has a 6 speed auto transmission and is powered by a 281HP 3.6L V6 Cylinder Engine. This vehicle has been upgraded with the following features: Bluetooth, Rear View Camera, Onstar. It has some remaining factory warranty for added peace of mind. Our Traverse's trim level is LS. The base LS model is affordably priced and comes loaded with standard features such as SiriusXM radio with CD player, 6.5-inch touch-screen display, Bluetooth, a rear view camera, reclining front bucket seats with premium cloth seat trim, air conditioning, remote keyless entry, a rear spoiler, and OnStar.